This year marks the 400th anniversary of the death of William Shakespeare. Universities and other institutions around the world have been organising special events and courses throughout the year. One of these special courses is Shakespeare 400, a joint effort of the University of Turku and Åbo Akademi University. The course runs from late October to mid-December. It comprises seven lectures by eight lecturers from four different departments: the Department of English at ÅAU, the Department of English at UTU, the Department of Cultural History (UTU), and the Department of Comparative Literature (UTU). There are altogether fifty students taking the course. 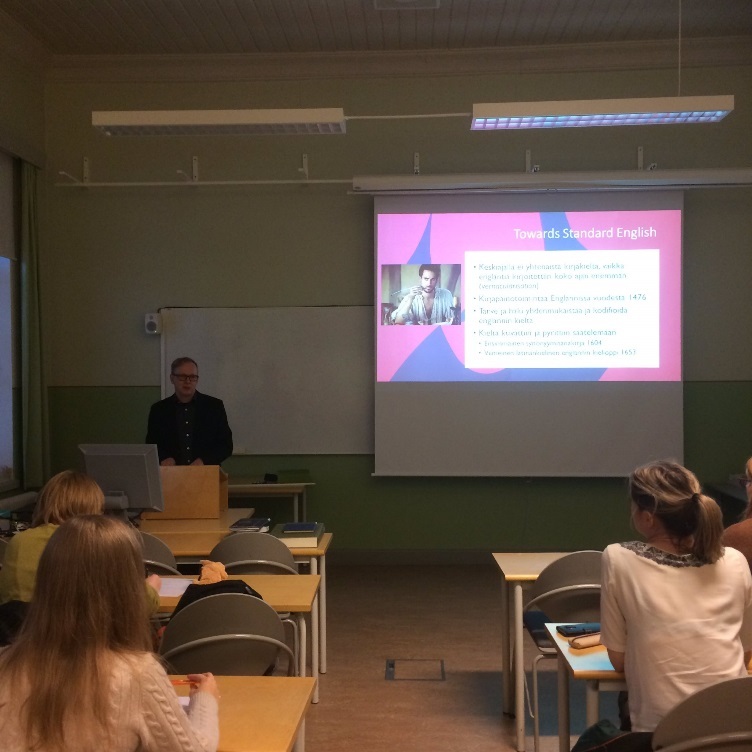 The lecture series started on 27 October with a joint lecture by Dr Janne Skaffari and Prof. Matti Peikola from our own department. Janne Skaffari offered a fascinating glimpse to Early Modern English and Shakespeare’s language. He finished the lecture by reciting a sonnet in what is known as ‘Original Pronunciation’, a reconstructed version of what ‘Shakespeare’s English’ might have sounded like. If that piqued your interest, have a look at Ben Crystal’s Hamlet here! Matti Peikola then moved on to discuss the early editions of Shakespeare plays. Although the First Folio is the most well-known edition of Shakespeare, defining the canon for years to come, it was only published after Shakespeare’s death by his colleagues. However, Shakespeare’s plays were already published individually during his lifetime, in a smaller and much cheaper quarto format. The first quarto edition of Hamlet was much shorter than the First Folio version! You can read more about the quartos here. Both Skaffari and Peikola reminded the audience that although Shakespeare has often been treated as a canonical author figure, many of his plays actually show evidence of collaborative authorship. Read more about recent findings here.